He’s playing in Topeka, Kansas right now, but soon, Dallas Tulik will be able to play close to home again. 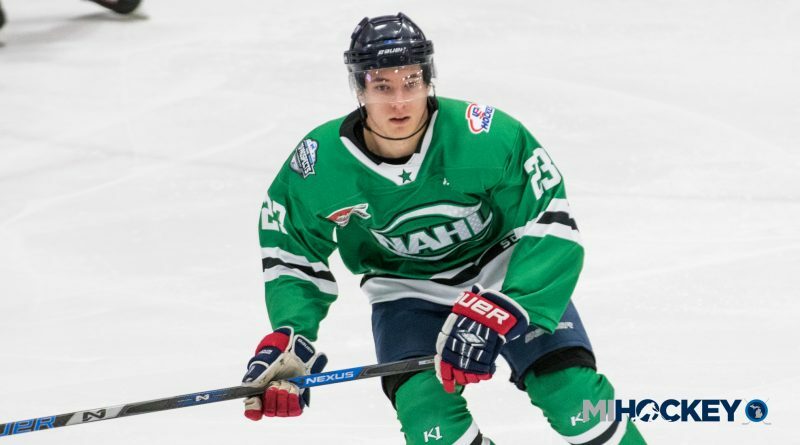 The Kalamazoo native – currently an assistant captain for the NAHL’s Topeka Pilots – has committed to Ferris State. The 20-year-old forward is currently leading the Pilots with 12 points in 11 games; his seven goals are tied for the top spot in the NAHL. Tulik played for Meijer, the West Michigan Hounds and Fox Motors before playing for the Winnipeg Blues of the Manitoba Junior Hockey League in 2016-17. Last year, his first in American juniors, he racked up 25 points in 44 games with the Pilots. He was invited to participate in the 2018 NAHL Top Prospects Tournament at USA Hockey Arena last February, where he recorded a goal and an assist for the South Division team.